Although there is intellectual property protection in China, many companies, wary of China's much-publicized reputation for counterfeiting and piracy, fail to enter the largest developing market in the world because of an excess of caution. By detailing protection procedures that work, this very practical handbook opens the door to a secure presence in the Chinese marketplace. 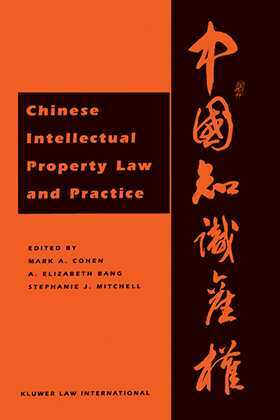 Chinese Intellectual Property Law and Practice covers every step a company's counsel or patent agent needs to take, from registration of rights to invoking the effective enforcement methods now in place under Chinese law, in order to ensure effective protection of copyrights, patents, trademarks, trade names, trade secrets, and licensing arrangements in China. Also included are numerous case studies from specific industries (including software, sporting goods, publishing, and luxury goods), a model contract, a bibliography, and a list of web sites.